How does your website rank against the best in your industry? Dynatrace (formerly Compuware APM) launched a new service called Performance Test. 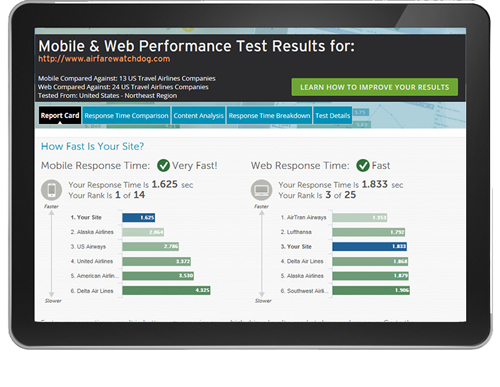 Free to all companies, Performance Test compares a site to its peers based on response time, content analysis and more – for both mobile and desktop sites. To run the test, Web and mobile site owners simply enter their web URL, choose a location to measure from and an industry to compare to. Dynatrace instantly generates a report to allow Internet professionals to see the end-user experience in an objective manner. Of course slow websites kill conversions and since competitor websites are setting the expectations of today’s consumers, it’s important businesses see where they stand against other sites.